Holiday Inn Express CARROLLTON (KY) Carrollton, Hotel null. Limited Time Offer! The Holiday InnRead more Express CARROLLTON (KY) has all the services one would expect of a two star hotel in Carrollton: Laundry. This establishment is more of a Family hotel .Relax yourself in the hotel's jacuzzi/whirlpool.It is part of the hotel chain Holiday Inn Hotels & Resorts.This hotel offers high speed internet.Practical information:This hotel has a parking. Located mid-way between Louisville and Cincinnati, off I-71, General Butler is in the small rural town of Carrollton. Situated on more than 800 acres, our resort provides a unique travel destination. From: Interstate 71. Take Exit 44 and head northbound on 227 for .75 miles. Turn right at the Arby's. 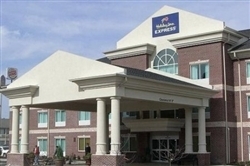 Conveniently located at Exit 44 off of I-71, this hotel is midway between Cincinnati, Ohio and Louisville, Kentucky.